Fractures of the pelvis often cause life threatening internal blood loss are one of the most serious musculoskeletal injuries. The SAM Sling is a non-invasive, easy to use, single-use device, which can be applied by first responders at the accident scene to individuals who have, or are suspected of having, a pelvic ring or lateral pelvic fracture. Pelvic fractures can occur in falls from a height, crush-type injuries or forceful blows, for example those sustained in motor vehicle collisions. Generally, the pelvis either collapses (lateral compression fracture) or expands (open-book fracture). 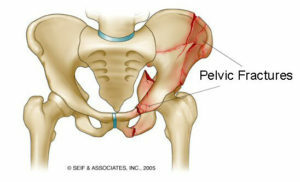 In both fractures, the pelvic ring usually breaks through the pubic symphysis and at the sacroiliac joint at the back. The mortality rate of pelvic ring fractures is reported to be more than 25%. The presence of pelvic fractures along with other injuries doubles or triples mortality and the average blood loss is two to three pints for every break. Pelvic belts or binders significantly reduce blood loss, as well as reduce and stabilize pelvic fractures. Trauma surgeons, orthopedic surgeons, and emergency doctors around the world recognize the problem and the solution as evidenced by the many different pelvic belts or jerry-rigged items (sheets, blankets, and upside down KEDs) devised to bind the pelvis. The SAM Sling effectively reduces and stabilises unstable pelvic fractures. It can be quickly and safely applied on the scene, before transport or in an emergency department. This protects the patient from further injury and allows for safe application on scene by ordinary EMS personnel. 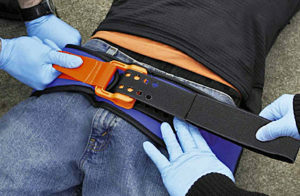 The SAM sling can be applied by first responders and ambulance personnel to stabilise the pelvis before transportation is initiated. This reduces the motion between the lower limbs and the torso which can impede coagulation and the formation of blood clots. Applying the SAM sling is very simple, starting with the patient laying flat on their back. First the sling is placed around the hip at the level of the pubis symphysis (not the waist) – this can be achieved by sliding the sling upwards from underneath the legs. The orange buckle is then held in place whilst tension is applied with the black strap through the buckle mechanism. The entire process of applying the splint and stabilising the pelvis takes less than five minutes and can be used by one or two people with minimal training. When the required sling tension is reached (150N/ 33lbs), the buckle locks, preventing too much tension being applied. This tension is maintained by pressing the tensioning handles on to the sides of the sling where they are held in place by velcro. Once at hospital, the sling can be left in place during x-rays (it is radiolucent and claimed to be almost invisible on x-rays) and until definitive stabilisation can be achieved.